While Saturday’s Philadelphia Union loss in Houston was painful to watch, it got me thinking about how the Union has fared this season when they have allowed 2 or more goals. As it turns out, not very well at all. The Union are 0–11–0 when they have conceded 2 or more goals in 2013 with 5 of those losses happening at home, 6 on the road. Over those 11 losses, the Union have allowed 27 goals while scoring 11, being shutout twice, scoring 1 goal 7 times, and twice scoring 2 goals for a goal difference of -16. In the 5 games in which they lost by 2 goals, opponents scored 13 goals to the Union’s total of 3. Of those 5 games, 3 happened on the road. The difference in goal totals is underscored by an enormous difference in shots on goal over these games with the Union recording 33 SOGs compared to 64 SOGs for opponents. This works out to an average of 3 SOGs per game for the Union and 5.8 per game for opponents. When you’re producing little more than half as many shots on goal as your opponents, it’s no surprise that you’re you’re probably letting in a lot of goals. At first glance, the margin between the Union and its opponents in shots over these games isn’t as large as might be expected, with the Union recording 141 compared to 147 for opponents. But a closer look reveals 5 comparatively anomalous games in which the Union recorded 15 or more shots for a total of 91 shots, during which opponents recorded 59 shots. In other words, these 5 games (45 percent of the 11 games) account for 65 percent of the Union’s total shots. Four of these games were at home. Nevertheless, despite recording fewer shots over those 5 games, opponents were still more efficient than the Union. 21 of the Union’s 91 shots in these games—23.1 percent—were on target. For opponents, 27 of their 59 shots were on target. That’s 45.8 percent, nearly double that of the Union’s. This greater efficiency is also apparent when we look at scoring percentage in these 5 games, which for the Union was 7.7 percent. For opponents, it was 20.3 percent. Returning to the 11 games overall in which the Union conceded 2 or more goals, 23.4 percent of their shots were on target compared to 43.5 percent for opponents. The Union’s scoring percentage was 7.8 percent while for opponents it was 18.4 percent. While 42.2 percent of opponents SOGs found the back of the net, 33.3 percent of the Union’s did. 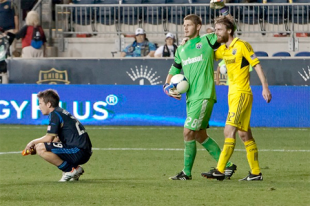 When the Union scored 2 or more goals, they are 7–2–0, with a 5–1–0 home record and 2–1–0 on the road. In such games they have outscored opponents 21 to 11, a goal difference of +10. In the 4 games in which they won by 2 or more goals, they outscored opponents 13 to 2. Despite all of these goals, opponents still recorded more shots (123) than the Union (106) in these games, which isn’t surprising considering the Union are next to last in the league for shots. In fact, the Union’s average of 11.8 shots in games in which they scored 2 or more goals is less than the average of 12.8 shots when they allow 2 or more goals. Interestingly, the average of 13.7 shot for opponents is higher than when the Union concede 2 or more goals. For the Union, the real difference emerges when we consider efficiency of shots. While level with opponents at 42 in total number of SOGs in games in which the Union have scored two or more goals, 39.6 percent of their shots were on target and of those 54.8 percent found the back of the net. For opponents, 34.1 percent of shots were on target, 26.2 percent of which found the back of the net. Overall, the Union recorded a scoring percentage of 21.7 percent in these games compared to 8.9 percent for opponents. Over the previous five games, the Union has scored 2 or more goals 3 times, winning twice. They’ve also conceded 2 or more goals twice for 2 losses. Looking ahead to the 2 remaining games of the season, the Union defeated Kansas City 4–0 in league play in June only to lose to them 2–0 in the semifinals of the US Open Cup in July. The Union scored 2 goals but allowed 3 in their home meeting with New York in May and then lost 2–0 at Red Bull Arena in July. If the season’s past results are any kind of predictor, we can expect a lot of goals over the next 2 games. Which team will be scoring them is another question. So wait… if we score more than the other team, we win? (mind blown!) just kidding. 1) We need a striker that can break down defenders and create shots. As great as Jack is, he is seriously lacking in this ability and needs to improve in the off season. 2) Zac still has a lot of improving to do. His save percentage for SOGs seems relatively low (would be interesting to compare to the rest of the league’s keepers). I really hope these two players work their tails off in the off-season. The only problem with getting recognition and starting at a young age is that many of these players never reach their full potential (coughAdu). I completely agree with you on Jack, but I think it’s less his lack of talent as it is his lack of size. Of all of Hackworth’s choices up front I think he’s the best choice to play alone, but there’s not a team in MLS that would pick him to play that position. He certainly needs to keep working in the off-season, but I can’t help but think how great Jack would be if he had a big, physcial partner to play alongside him and take at least one center back off Jack. Ideally I would like to see that player be parked in the center of the pitch and Jack would rotate and swing around him looking for space. But we’ll see what they do in the offseason. Yeah, still would love to see a bigger target striker to play next to Jack. Though an all around good one, I don’t want some lumbering giant with no touch or skill up there either. And for Zac, interestingly using MLS.com it actually looks like he is 9th in the league in Sv% (ignoring everyone above him who played less than 1000 minutes). Though with him, we already know he is a good shot stopper, but once he learns and gets better with positioning and anticipation his % should shoot up.